“Sit up straight you moron.” Most of us heard this countless times from our parents growing up (minus the moron we hope). The reality is though… the folks were right. Proper posture is important and only becomes more important as one ages – it sets a good impression, conveying a confident and professional manner while also saving one from the chronic aches and pains later in life. As technology plays an increasingly prominent role in our lives, maintaining proper posture becomes even more important as we spend a way too much time hunched over a keyboard or phone. Fortunately, you can improve your posture at any point in life simply by making a few habitual changes. While healthy posture may feel uncomfortable at first, your body will learn to adjust and you’ll gradually notice greater comfort throughout your body and reduced symptoms of chronic pain. We reached out to our friends and experts at BetterPT for some tips and advice on how to straighten up. Why Is Good Posture Important For My Health? Fixing your posture starts with making adjustments to the way you hold your body when sitting and lying down. It’s common for people to slump down in these positions, but it’s easy to start improving the quality of your posture. 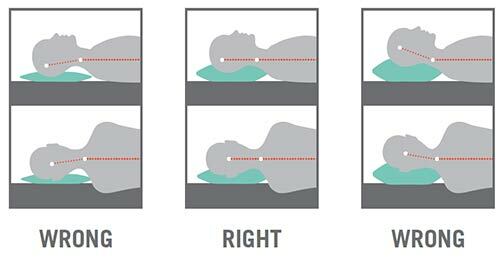 When sleeping, you should be lying on your back or side on a firm mattress with the pillow supporting your head (but not your shoulders). Make sure to avoid sleeping on your stomach, as doing so can cause substantial strain on your back, especially on a softer mattress. Correct sitting posture starts with a straight back that’s entirely against the chair from your buttocks to shoulders. Your feet should be uncrossed and lightly touching the floor and you should take a break from sitting in the same position every 30 minutes in order to avoid fatigue. The majority of Americans suffer from back pain at some point in their lives and chronic bad posture is a leading cause of these symptoms. Making simple, easy adjustments to your posture when sitting and lying down will significantly lower your risk of suffering pain and discomfort later in life. Best of all, it’s never too early to start.